#AskUS: Responding to activists or managing them? You are here: Home / Blog / #AskUS: Responding to activists or managing them? There is much hype among advocates about the meeting that Save Darfur’s Jerry Fowler and STAND’s Layla Amjadi are scheduled to have with Gen. Scott Gration and Samantha Power – a meeting that will be webstreamed in real time this coming Tuesday Nov. 10. 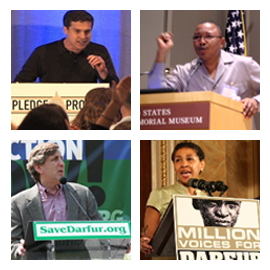 STAND is giving advocates the opportunity to vote for what questions should be asked, and Save Darfur is getting people to tweet their questions (use #AskUS). In many respects it’s an exciting use of new media tools to connect activists and policymakers, and reflects the overall “engage with everyone” approach of the Obama Administration. But there is also skepticism in some advocacy quarters given that the condition of this “live” meeting is that the Administration receives the advocates’ questions in advance. I have no problem in general with sending people questions in advance. It depends on the interview, but often you get better answers, and avoid the “I’ll have to get back to you on that” problem. Moreover, whether you sent the questions in advance or not, the answers that you get are useful, if for no other reason than that you can subsequently hold the respondent to account on what they have said. The analysis is a little different though, when it comes to broadcasting an interview live. For Tuesday’s meeting, the advocates have been able to negotiate permission to ask follow-up questions that won’t have been previewed by the Administration. Were it not for this saving grace, I would still have no problem with the meeting, but I would be slamming it hard for its “live” billing. To my thinking, there will be nothing inherently “live” about the Q & A itself. The advocates will be asking questions that Gration and Power will have approved answers at the ready to respond with – it’s a staged performance, recorded live. While the Administration gets the respondents’ benefit of going live (i.e. the chance to reach the audience without editorial filtering), the questioners’ lose the benefit of getting a spontaneous answer (although presumably both the advocates and the Administration gain in terms of viewing numbers). There will be some people reading this who I can already hear venting sighs of frustration: Here is an Administration doing exactly what a responsive government should do – engage with activists. Start to question this and you’re putting them in a “damned if they do damned if they don’t” box. That is not my intent. I will be watching the webcast as keenly as everyone else. My interest in the issue that this raises in more general terms is book-related. One of the persistent questions that hangs over the interaction between activists and policymakers is the extent to which policymakers are responding to activists vs. managing them. And activists have to be on constant alert to the perils of the latter, particularly because government can so easily give the perception of responsiveness by granting access that activists wouldn’t ordinarily have. Save Darfur has not been ‘managed’ through this process in any way. In fact, the webcast was an idea that came from the Save Darfur office in August. We hope this kind of access continues and we look forward to an insightful interview where every question – and follow up question – is answered fully.